Quick Nutshell Version: (No pun intended, ha ha.) I wanted to do a nutshell version on the top of this blog because I tried different ways of doing it, and this gets straight to the best one, in my opinion. You can read more details below if you want and check out the photos and the recipe at the bottom. Crack open the acorns with a nut cracker or hammer and pull out the meat. 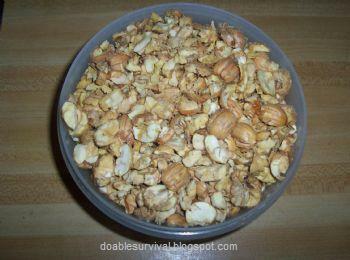 (I found it easiest to crack a bunch in a pile and go back and pull out the nut meat.) 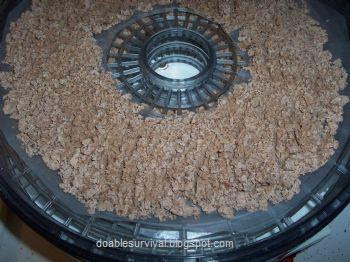 Grind them in a blender so that the bitter tannins will come out faster in the water (leaching). 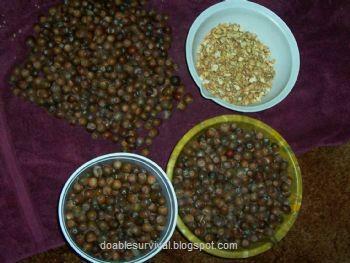 Unlike my first times making it below, you don't have to boil the acorns repeatedly (wasting energy). Simply soak them in warm water baths, an hour or so at a time, straining the water out in between, until the bitterness is gone, about 3 times. (Red Oak acorns are more bitter.) 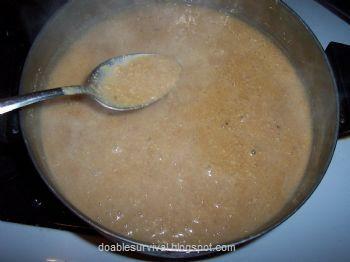 Use cheesecloth or an old clean T-shirt to strain it. (You may have to push it through the first time or scrape the sides with a spatula to get the water out.) Then, spread on a cookie sheet and dry in the oven on low (200) or dehydrate in the sun or a dehydrator. Blend again just to make it nice and smooth. Store in the refrigerator or freezer. If you do a search on line for "acorn flour recipes" you will find recipes for muffins, pancakes, bread, etc. 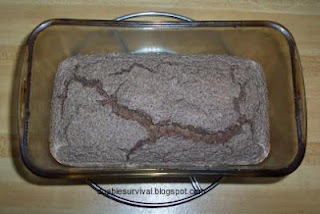 I posted two different bread recipes below with pictures. It can be used to supplement your flour to make it stretch farther in hard times. There is a way to "cold water leech" it too, under a water fall or in a stream, but that's not something I tried. 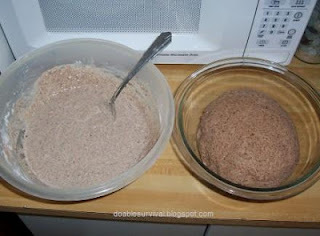 It chops up easy in the blender and then starts to stick together a little, so just pull it out. I boiled it and then tried straining it through cheese cloth first, but it just sat there; and the piece of cloth wasn't big enough to really pick up and wring it out; so I did what one web site suggested and got an old (clean) T-shirt and tried straining it through that. It still doesn't strain well the first time and you have to push the liquid out through it. I'd actually pick it up in the fabric, twisting the top of the fabric down on it and pushing on it. The last two times, it strained through easily though. Scraping the sides with a spatula helps to release the water out too. It would have been easiest for me to use my big cookie sheet and dry it in the oven on low but my oven isn't working so I used my dehydrator. I cut waxed paper to put it on so it doesn't fall through, but you have to leave open spaces around the edges for the air to get through. Mix it up now and then so it dries evenly. Update, fourth (last) batch: So, skeptical, I did the warm water baths, not boiling it. The web site said to soak for an hour and then strain, repeating about 3 times. I did this (except I was busy doing other things and let it soak about a total of 5 hours). I heated it on the stove a few times (but not boil) because my house is very cold this time of year. Lo and behold, it worked!! The bitterness was gone! 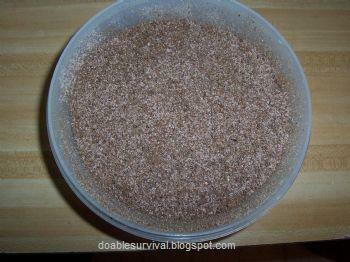 This solves one of the problems that really bugged me about making acorn flour, using energy to boil it several times. Yay! My oven is fixed (thanks Ernie! ), so I'm modifying this blog just a bit. 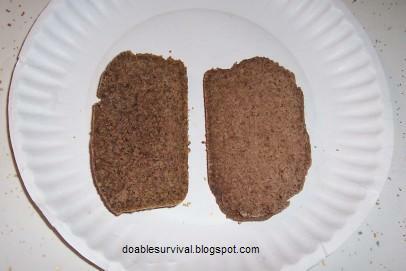 Ok, I tried two different acorn bread recipes. One has yeast, and you make it like you would regular bread. Kneed it, let it rise in the bowl, kneed it, let it rise in the pan and bake. (Really, you could probably just let it rise once in the pan and bake it.) Acorn flour is heavier, so it doesn't rise a lot like regular bread does when I make it. The other recipe has an egg, baking soda, etc., and it ends up like a thick cake batter that you just pour in the pan like when I make Zucchini bread. They both taste similar and are very good, nutty. Overall, I liked the yeast one better. It was thicker/heavier but I liked the consistency and taste better. Bread dough with egg on the left, bread dough with yeast on the right. ..the bread with yeast on the right. Bake, 400 degrees, 25-30 minutes. You can use a bread maker, but I'm clueless about that. I did it like regular bread. Knead it, put it back in the bowl and let it rise. Then make the loaf, put it in a buttered bread pan, and let it rise. I brush it with melted butter to keep it soft while it rises. Tasty!!! 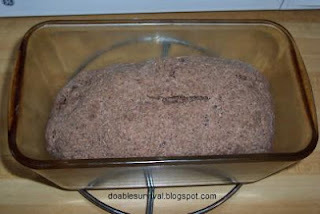 Mix, pour in buttered bread pan, bake 400 degrees, 25-30 minutes. 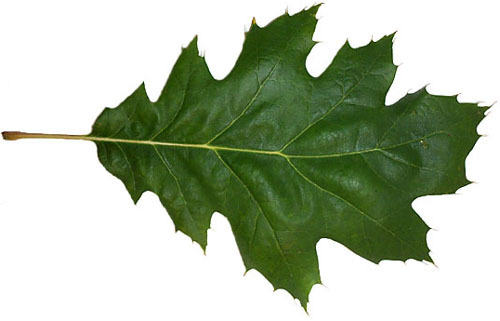 I read somewhere that you should use white oak acorns because the red oak acorns tannin can cause kidney damage. Do you know anything about that? 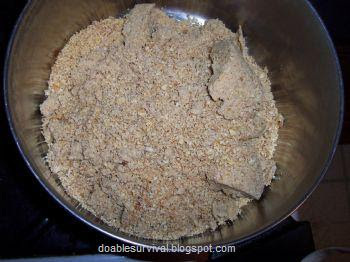 I use this blog in addition to a wonderful book I have to make acorn flour. It is very hard to get it ground fine enough if the smallest you can is with a coffee grinder! It has a somewhat nutty-milky smell. I have used it once so far, and have made two batches, with a third planned. I used white acorns (primarily bur oak) and they didn't take more than three leachings. Thanks for the comment. :) I used my Magic Bullet blender to blend it up good. It starts to stick together; but by then, it was chopped up pretty good anyway.